Pittsburgh-based Atlas Resource Partners (ARP) is entering the Eagle Ford in a $225-million deal. ARP will acquire 22 producing wells and 19 undeveloped locations containing estimated net reserves of 12-million BOE, according to company officials. The seller was not disclosed. The producing wells are all located in Atascosa County, TX, which is the heart of the Eagle Ford oil window. The oil cut from these wells is 87%, with 7% NGLs and 6% natural gas. ARP officials did not indicate the exact county or counties for the undeveloped drilling locations. The transaction, which has an effective date of July 1, 2014, is expected to close some time in the fourth-quarter. The company will pay $200-million of the purchase price at closing. In connection with the acquisition, Atlas Energy, L.P.'s (ATLS) E&P development subsidiary will purchase eight wells that have already been drilled, but are uncompleted, in the play. The $115-million purchase also includes 53 undeveloped Eagle Ford locations. 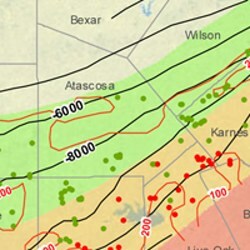 ARP is an exploration & production master limited partnership which owns an interest in over 14,000 producing natural gas and oil wells, located primarily in Appalachia, the Barnett Shale (TX), the Mississippi Lime (OK), the Raton Basin (NM), Black Warrior Basin (AL) and the oil-rich Rangely Field (CO).